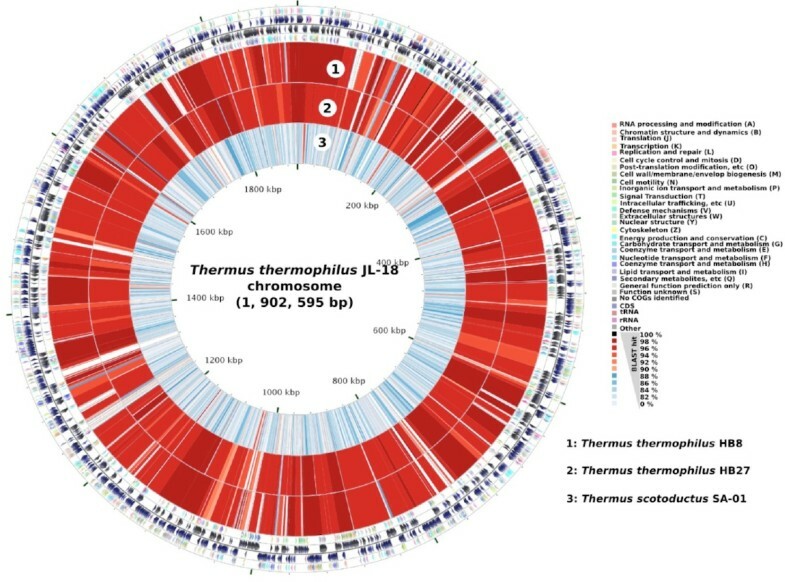 The complete genomes of Thermus oshimai JL-2 and T. thermophilus JL-18 each consist of a circular chromosome, 2.07 Mb and 1.9 Mb, respectively, and two plasmids ranging from 0.27 Mb to 57.2 kb. 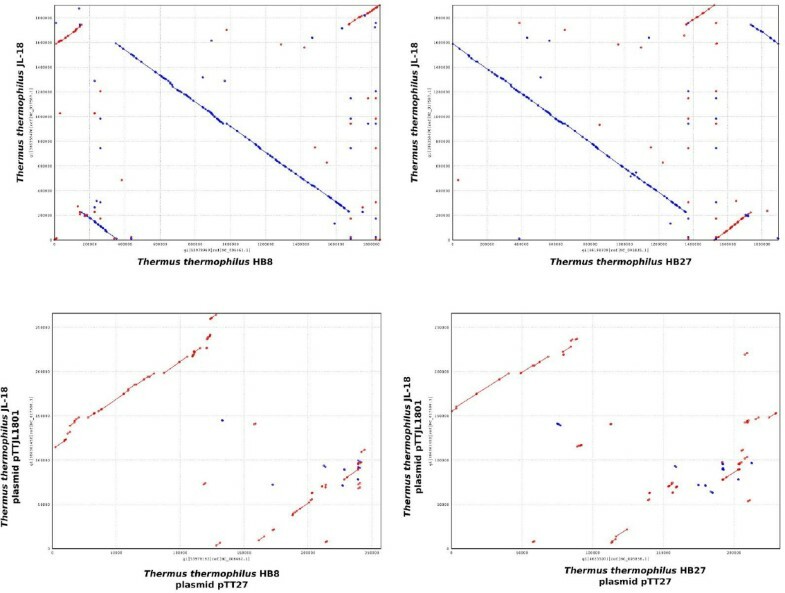 Comparison of the T. thermophilus JL-18 chromosome with those from other strains of T. thermophilus revealed a high degree of synteny, whereas the megaplasmids from the same strains were highly plastic. The T. oshimai JL-2 chromosome and megaplasmids shared little or no synteny with other sequenced Thermus strains. Phylogenomic analyses using a concatenated set of conserved proteins confirmed the phylogenetic and taxonomic assignments based on 16S rRNA phylogenetics. Both chromosomes encode a complete glycolysis, tricarboxylic acid (TCA) cycle, and pentose phosphate pathway plus glucosidases, glycosidases, proteases, and peptidases, highlighting highly versatile heterotrophic capabilities. Megaplasmids of both strains contained a gene cluster encoding enzymes predicted to catalyze the sequential reduction of nitrate to nitrous oxide; however, the nitrous oxide reductase required for the terminal step in denitrification was absent, consistent with their incomplete denitrification phenotypes. A sox gene cluster was identified in both chromosomes, suggesting a mode of chemolithotrophy. In addition, nrf and psr gene clusters in T. oshmai JL-2 suggest respiratory nitrite ammonification and polysulfide reduction as possible modes of anaerobic respiration. The Great Boiling Spring (GBS) geothermal system is located in the northwestern Great Basin near the town of Gerlach, Nevada. Geothermal activity is driven by deep circulation of meteoric water, which rises along range-front faults at temperatures up to 96 ̱C. A considerable volume of geomicrobiology research has been conducted in the GBS system, including coordinated cultivation-independent microbiology and geochemistry studies [1–4], habitat niche modeling , thermodynamic modeling [1,5], microbial cultivation and physiology [6,7], and integrated studies of the nitrogen biogeochemical cycle (N-cycle [5,6,8]). The latter group of studies is arguably the most detailed body of work on the N-cycle in any geothermal system. Those studies revealed a dissimilatory N-cycle based on oxidation and subsequent denitrification of ammonia supplied in the geothermal source water. In high temperature sources such as GBS and Sandy’s Spring West (SSW), ammonia oxidation occurs at temperatures up to at least 82 ºC at rates comparable to those in nonthermal aquatic sediments . Several lines of evidence, including deep 16S rRNA gene pyrosequencing datasets and quantitative PCR, suggest ammonia oxidation is carried out by a single species of ammonia-oxidizing archaea closely related to “Candidatus Nitrosocaldus yellowstonii”, which comprises a substantial proportion of the sediment microbial community in some parts of the springs [5,9]. Nitrite oxidation appears to be sluggish or non-existent in the high temperature source pools since nitrite accumulates in these systems and 16S rRNA gene sequences for nitrite-oxidizing bacteria have not been detected in clone library and pyrotag censuses [1,5]. Finally, the nitrite and nitrate that are produced are denitrified in the sediments to both nitrous oxide and dinitrogen; however, a high flux of nitrous oxide, particularly in the ∼80 ̱C source pool of GBS, suggested the importance of incomplete denitrifiers  and electron donor stimulation experiments suggested a key role for heterotrophic denitrifiers . A subsequent cultivation study of heterotrophic denitrifiers in GBS and SSW resulted in the isolation of a large number of denitrifiers belonging to Thermus thermophilus and T. oshimai, including strains T. oshimai JL-2 and T. thermophilus JL-18 . Strikingly, although Thermus strains were isolated using four different isolation strategies, nine different electron donor/acceptor combinations, and four different sampling dates, all isolates of these two species were able to convert nitrate-N stoichiometrically to nitrous oxide-N, but appeared unable to reduce nitrous oxide to dinitrogen. This physiology, combined with high nitrous oxide fluxes in situ suggested a significant role of T. oshimai and T. thermophilus in the unusual N-cycle in these hot springs. However, the genetic basis of this phenotype remained unknown. Here we present the complete genome sequences of T. oshimai JL-2 and T. thermophilus JL-18, compare them to genomes of other sequenced Thermus spp., and discuss them within the context of their potential impacts on biogeochemical cycling of carbon, nitrogen, sulfur, and iron. The genus Thermus currently comprises 16 species and includes the well-known T. aquaticus and the genetically tractable T. thermophilus. The genome of T. oshimai JL-2 is the first finished genome to be reported from that species, while T. thermophilus JL-18 is the fourth genome to be sequenced from that species, the other being T. thermophilus HB27, HB8, and SG0.5JP17-16. Figure 1 shows the relationship of T. oshimai JL-2 and T. thermophilus JL-18 to other Thermus species, as determined by phylogenomic analysis of highly conserved genes, which supports the taxonomic identities previously determined by 16S rRNA gene phylogenetic analysis . Table 1 shows general features of T. oshimai JL-2 and T. thermophilus JL-18. 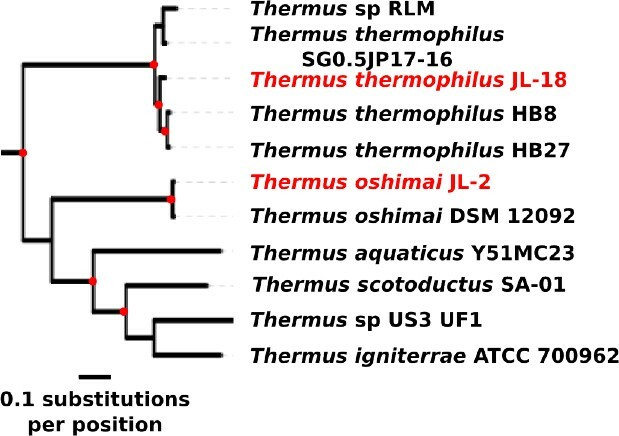 Phylogenomic tree highlighting the position of Thermus oshimai JL-2 and Thermus thermophilus JL-18. Thirty-one bacterial phylogenetic markers were identified using Amphora . Maximum-likelihood analysis was carried out with a concatenated alignment of all 31 proteins using RAxML Version 7.2.6  and the tree was visualized using iTOL . Red circles indicate bootstrap support >80% (100 replicates). Scale bar indicates 0.1 substitutions per position. The protein FASTA files for all the species are from NCBI, except for the following species, which are from IMG: Thermus igniterrae ATCC 700962 (Taxon OID: 2515935625), Thermus oshimai DSM 12092 (Taxon OID: 2515463139), Thermus oshimai JL-2 (Taxon OID: 2508706991), Thermus sp. RLM (Taxon OID: 2514335427). Classification and general features of Thermus oshimai JL-2 according to the MIGS recommendations . aEvidence codes - IDA: Inferred from Direct Assay; TAS: Traceable Author Statement (i.e., a direct report exists in the literature); NAS: Non-traceable Author Statement (i.e., not directly observed for the living, isolated sample, but based on a generally accepted property for the species, or anecdotal evidence). These evidence codes are from Gene Ontology project . Classification and general features of Thermus thermophilus JL-18 according to the MIGS recommendations . T. oshimai JL-2 and T. thermophilus JL-18 were selected based on their important roles in denitrification and also for their biotechnological potential. The genome projects for both the organisms are deposited in the Genomes OnLine Database  and the complete sequences are deposited in GenBank. Sequencing, finishing, and annotation were performed by the DOE Joint Genome Institute (JGI). A summary of the project and information associated with MIGS version 2.0 compliance  are shown (T. oshimai JL-2; Table 2(a) and T. thermophilus JL-18; Table 2(b)). Axenic cultures of T. oshimai JL-2 and T. thermophilus JL-18 were grown aerobically on Thermus medium as described  and DNA was isolated from 0.5–1.0 g of cells using the Joint Genome Institute’s (JGI) cetyltrimethyl ammonium bromide protocol . The draft genomes of Thermus oshimai JL-2 and Thermus thermophilus JL-18 were generated at the DOE Joint Genome Institute (JGI) using a combination of Illumina  and 454 technologies . For T. oshimai JL-2, we constructed and sequenced an Illumina GAii shotgun library which generated 146,341,736 reads totaling 11,122 Mb, a 454 Titanium standard library which generated 181,476 reads and 1 paired end 454 library with an average insert size of 8 kb that generated 285,154 reads totaling 146.6 Mb of 454 data. For T. thermophilus JL-18, we constructed and sequenced an Illumina GAii shotgun library that generated 74,093,820 reads totaling 5,631.1 Mb, a 454 Titanium standard library that generated 212,217 reads and 1 paired end 454 library with an average insert size of 7 kb that generated 121,082 reads totaling 116.9 Mb of 454 data. All general aspects of library construction and sequencing performed at the JGI can be found at . The initial draft assemblies of T. oshimai JL-2 and T. thermophilus JL-18 contained 39 contigs in 2 scaffolds and 75 contigs in 3 scaffolds, respectively. The 454 Titanium standard data and the 454 paired end data were assembled together with Newbler, version 2.3-PreRelease-6/30/2009. The Newbler consensus sequences were computationally shredded into 2 kb overlapping fake reads (shreds). Illumina sequencing data was assembled with VELVET, version 1.0.13 , and the consensus sequence were computationally shredded into 1.5 kb overlapping fake reads (shreds). We integrated the 454 Newbler consensus shreds, the Illumina VELVET consensus shreds and the read pairs in the 454 paired end library using parallel phrap, version SPS - 4.24 (High Performance Software, LLC). The software Consed  was used in the following finishing process. Illumina data was used to correct potential base errors and increase consensus quality using the software Polisher developed at JGI (Alla Lapidus, unpublished). Possible mis-assemblies were corrected using gapResolution (Cliff Han, unpublished), Dupfinisher  or sequencing cloned bridging PCR fragments with subcloning. Gaps between contigs were closed by editing in Consed, by PCR and by Bubble PCR (J-F Cheng, unpublished) primer walks. Additional reactions were necessary to close gaps and to raise the quality of the finished sequence (T. oshimai JL-2: 20 reactions; T. thermophilus JL-18: 45). The total size of the genomes are 2,401,329 bp (T. oshimai JL-2) and 2,311,212 bp (T. thermophilus JL-18). The final assembly of T. oshimai JL-2 genome is based on 91.8 Mb of 454 draft data which provides an average 38.3× coverage of the genome and 5,349.4 Mb of Illumina draft data which provides an average 2,228.9× coverage of the genome. The final assembly of T. thermophilus JL-18 genome is based on 87.7 Mb of 454 draft data which provides an average 38.1× coverage of the genome and 690 Mb of Illumina draft data which provides an average 300× coverage of the genome. The data and metadata are made available at the JGI Integrated Microbial Resource website (IMG) . Initial identification of genes was done using Prodigal , a part of the DOE-JGI Annotation pipeline, followed by manual curation using GenePRIMP . The predicted ORFs were translated into putative protein sequences and searched against databases including: NCBI nr, Uniprot, TIGR-Fam, Pfam, PRIAM, KEGG, COG, and Interpro. Additional annotations and curations were performed using the Integrated Microbial Genomes - Expert Review (IMG-ER) platform . The T. oshimai JL-2 genome includes one circular chromosome of 2,072,393 bp (2205 predicted genes), a circular megaplasmid, pTHEOS01 (0.27 Mb, 268 predicted genes), and a smaller circular plasmid, pTHEOS02 (57.2 Kb, 75 predicted genes), for a total size of 2,401,329 bp. Of the total 2,548 predicted genes, 2,488 were protein-coding genes. A total of 2,015 (79%) protein-coding genes were assigned to a putative function with the remaining annotated as hypothetical proteins. The properties and the statistics of the genome are summarized in Table 3a, Table 3b, Table 3c and Figure 2). Map of T. oshimai JL-2 chromosome compared with other Thermus chromosomes. The outer four circles show the genes in forward and reverse strands and their corresponding COG categories. BLASTN hits (percentage identities) from T. thermophilus HB8 (1), T. thermophilus HB27 (2), and T. scotoductus SA-01 (3) chromosomes are shown in the inner three circles. Maps were created using CGView Comparison Tool . bPseudogenes may also be counted as protein coding or RNA genes, so is not additive under total gene count. The T. thermophilus JL-18 genome includes one circular chromosome of 1,902,595 bp (2,057 predicted genes), a circular megaplsmid, pTTJL1801 (0.26 Mb, 279 predicted genes), and a smaller circular plasmid, pTTJL1802 (0.14 Mb, 172 predicted genes), for a total size of 2,311,212 bp. Of the total 2,508 predicted genes, 2,452 were protein-coding genes. A total of 1,979 (79%) of protein-coding genes were assigned to a putative function with the remaining annotated as hypothetical proteins. The properties and the statistics of the genome are summarized in Table 4a, Table 4b, Table 4c and Figure 3. Map of T. thermophilus JL-18 chromosome compared with other Thermus chromosomes. The outer four circles show the genes in forward and reverse strands and their corresponding COG categories. BLASTN hits (percentage identities) from T. thermophilus HB8 (1), T. thermophilus HB27 (2), and T. scotoductus SA-01 (3) chromosomes are shown in the inner three circles. Maps were created using CGView Comparison Tool . The chromosome of T. thermophilus JL-18 was compared with the chromosomes of T. thermophilus strains HB8 and HB27  using nucmer . The megaplasmid pTTJL1801 was also compared with the megaplasmid sequences of HB8 and HB27. Dot plot results from this analysis (Figure 4(a)) demonstrate a high degree of synteny between the chromosomes of JL-18, HB8, and HB27; however, little synteny exists between the megaplasmids. 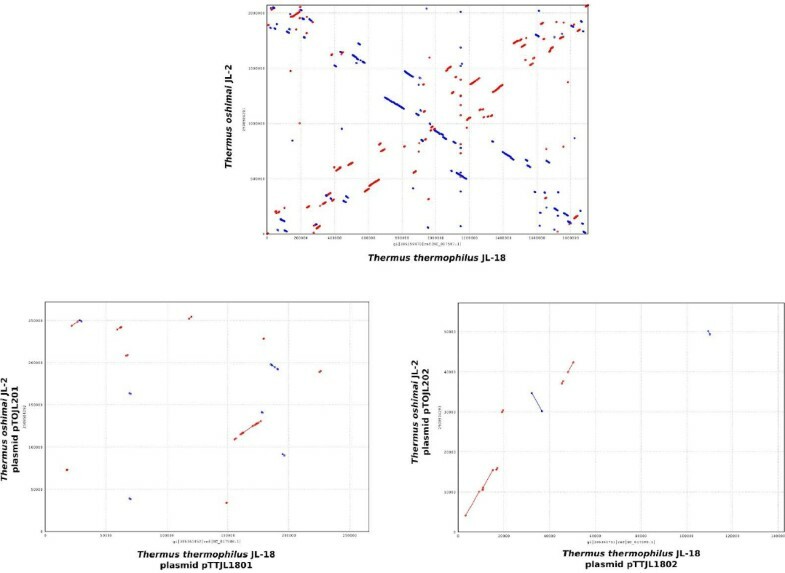 T. oshimai JL-2 chromosome and megaplasmid sequences were also compared with those of T. thermophilus JL-18; however, little very synteny was apparent (Figure 4(b)). Dot plot comparison of T. thermophilus JL-18 chromosome and megaplasmid DNA sequence with those of the strains HB8 and HB27. Dot plot comparing the chromosome and megaplasmid DNA sequence of T. oshimai JL-2 and T. thermophilus JL-18. T. oshimai JL-2 and T. thermophilus JL-18 genomes encode genes for complete glycolysis, tricarboxylic acid (TCA) cycle, and pentose phosphate pathway (Figure 5). The genomes also encode glucosidases, glycosidases, proteases, and peptidases, highlighting the ability of these species to use various carbohydrate and peptide substrates. Thus, central carbon metabolic pathways are very similar to those of T. thermophilus HB27  and T. scotoductus SA-01 . Metabolic pathways identified using iPATH2 . 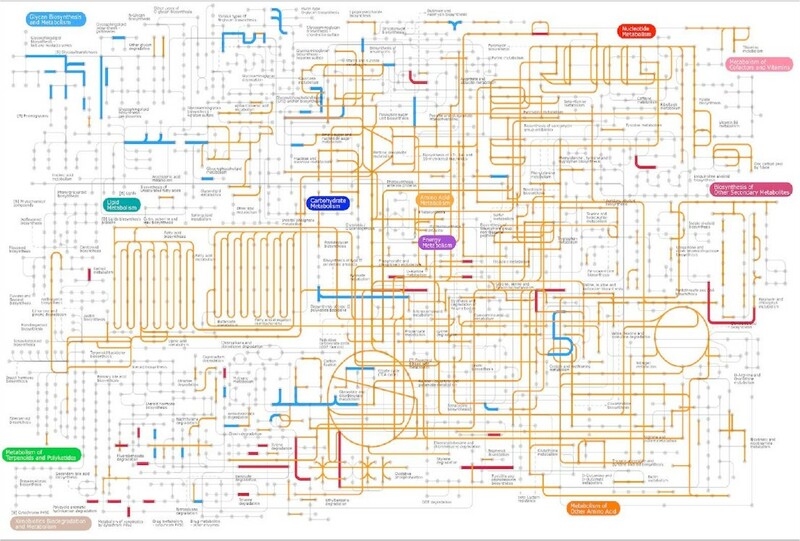 Orange lines are common pathways that were identified in T. oshimai JL-2 and T. thermophilus JL-18. Blue lines indicate pathways unique to T. oshimai JL-2 and red lines indicate pathways unique to T. thermophilus JL-18. Denitrification involves the conversion of nitrate to dinitrogen through the intermediates nitrite, nitric oxide, and nitrous oxide and is mediated by nar, nir, nor, and nos genes . Incomplete denitrification phenotypes terminating in the production of nitrous oxide have recently been reported for a large number of Thermus isolates, including T. oshimai JL-2 and T. thermophilus JL-18 . Figure 6 shows the organization of the nar operon and neighboring genes involved in denitrification in T. oshimai JL-2, T. thermophilus JL-18, and T. scotoductus SA-01. These gene clusters are located on the megaplasmids of T. oshimai JL-2 and T. thermophilus JL-18, as in other T. thermophilus strains [44,45]. They are located on the chromosome in T. scotoductus SA-01 . The nar operons show a high degree of synteny and all include genes encoding the membrane-bound nitrate reductase (NarGHI), the associated periplasmic cytochrome NarC, and the dedicated chaperone NarJ. All three strains contained homologs of NarK1, which is a member of the major facilitator superfamily that likely functions as a nitrate/proton symporter [46,47]. However, some experiments in T. thermophilus HB8 suggest NarK1 might also function in nitrite extrusion . T. oshimai JL-2 and T. scotoductus SA-01 also contain homologs of NarK2 (annotated as nep in T. scotoductus SA-01 ), which likely encodes a nitrate/nitrite antiporter [44,48]. No significant BLASTP hits for periplasmic nitrate reductase subunits NapB and NapC were found in T. oshimai JL-2 and T. thermophilus JL-18, consistent with the use of the Nar system in the Thermales. Map showing the organization of nar operon and neighboring genes involved in denitrification located on the megaplasmids of T. oshimai JL-2 (pTHEOS01) and T. thermophilusJL-18 (pTTJL1801) and the chromosome of T. scotoductus SA-01. Fe: heme protein-containing nitrite reductase, Cu: copper-containing nitrite reductase. Numbers below the genes indicate the provisional ORF numbers in T. oshimai JL-2 (Theos_1057–Theos_1036) and T. thermophilus JL-18 (TtJL18_2297 to TtJL18_2327), the locations in the megaplasmid are indicated below. nar: nitrate reductase; nir: nitrite reductase; nos: nitric oxidereductase; dnr: denitrification regulator [41–43]. All three strains contain a dnrST operon adjacent to, but divergently transcribed from, the narGHJIK operon. dnrST encodes transcriptional activators responsible for upregulation of the nitrate respiration pathway in the absence of O2 and the presence of nitrogen oxides or oxyanions  (Figure 6). Both the species contain a putative nirK, which encodes the NO-forming, Cu-containing nitrite reductase. In addition, T. oshimai JL-2 and T. scotoductus SA-01 both harbor nirS , which encodes the isofunctional tetraheme cytochrome cd1-containing nitrite reductase. Previous studies have suggested that bacteria use either NirK or NirS, but not both, for the reduction of nitrite . The unique presence of NirK and NirS in T. oshimai JL-2 and T. scotoductus SA-01 likely enhances their denitrification abilities since isoenzymes are typically kinetically distinct and/or regulated differently. This idea is consistent with the distinct denitrification phenotypes of T. oshimai strains as compared to T. thermophilus strains reported previously, including strains T. oshimai JL-2 and T. thermophilus JL-18 . In those studies, nitrite accumulated in the medium at concentrations of <150 µM in T. thermophilus strains, whereas it was rapidly produced to concentrations >200 µM but consumed rapidly to below method detection limits in T. oshimai strains. NirK functions as a homo-trimer  and contains type 1 (blue) and type 2 (non-blue) copper-binding residues . Comparison of the NirK from T. oshimai JL-2 and T. scotoductus SA-01 with previously studied NirK amino acid sequences revealed that six of the seven copper-binding residues are conserved, except for a single methionine (M) to glutamine (Q) substitution in both Thermus proteins (Figure 7; indicated by an asterisk (*)). Glutamine, not methionine, is the copper-binding ligand in the case of stellacyanin, a blue (type 1) copper-containing protein [52,53]. A M121Q recombinant protein of Alcaligenes denitrificans azurin showed similar electron paramagnetic resonance (EPR), but exhibited a 100-fold lower redox activity when compared to wild-type azurin . Therefore, although the methionine is replaced with a glutamine in the T. oshimai JL-2 NirK, it is possible that this glutamine residue can function as a copper-binding ligand similar to stellacyanin and azurin. The large and small subunits of nitric oxide reductase (NorB and NorC) are predicted to be co-transcribed along with nitrite reductases in T. oshimai JL-2, T. thermophilus JL-18 and T. scotoductus SA-01 (Figure 6). Thermus oshimai JL-2 gene Theos_1053 encodes a Copper-containing nitrite reductase. Amino acid sequences of known Cu-containing nitrite reductases from Pseudomonas aureofaciens (P. aureofaciens, GI: 287907), Achromobacter cycloclastes (A. cycloclastes, GI: 157835402), Rhodobacter sphaeroides ATCC 17025 (R. sphaeroides 17025, GI: 146277634), Rhodobacter sphaeroides KD131 (R. sphaeroides KD131, GI: 221638756), Alcaligenes faecalis (A. faecalis, GI: 393758960), Alcaligenes xylosoxidans (A. xylosoxidans, GI: 422318032), Nitrosomonas europaea (N. europaea, GI: 30248928), Neisseria meningitidis Z2491 (N. meningitidis Z2491, GI: 218768658) and Thermus scotoductus SA-01 (T. scotoductus SA-01, GI: 320450829) were aligned using Muscle v3.8.31  along with Thermus oshimai JL-2 (T. oshimai JL-2, GI: 410732282) Theos_1053. Putative copper-binding residues are indicated with downward arrows according to their classes: 1: type 1 (blue) Cu; 2: type 2 (nonblue) Cu . Numbers on left and right of the alignments refer to positions in the alignment. Asterisk (*) indicates the M→Q substitution in T. oshimai JL-2 and T. scotoductus SA-01. Genes encoding the 15 subunit NADH-quinone oxidoreductase  were identified in both genomes (Theos_0703 to 0716, 1811 in T. oshimai JL-2; TTJL18_1786 to 1799, 1580 T. thermophilus JL-18). nrcDEFN, a four gene operon encoding a novel NADH dehydrogenase, is adjacent to the nar operon in the megaplasmid of T. thermophilus HB8 and has been previously implicated in nitrate reduction . In T. thermophilus JL-18, the operon is present (Figure 6), although (TTJL18_2313) is truncated (NarE in HB8: 232 AA, in JL-18: 78 AA). In T. oshimai JL-2, only nrcN is present. Theos_0161 and Theos_0162, orthologs of Wolinella succinogenes NrfA and NrfH , respectively, were identified in T. oshimai JL-2 suggesting that T. oshimai JL-2 may be capable of respiratory nitrite ammonification, although this phenotype has not yet been observed in Thermus . Other possible electron transport components include a ba3-type heme-copper oxidase (Theos_1499, 1498, 1497, T. oshimai JL-2; TTJL18_0925, 0926, 0927 T. thermophilus JL-18) and bc1 complex encoded by the FbcCDFB operon . (Theos_0106 to 0109, T. oshimai JL-2; TTJL18_2018 to 2021 T. thermophilus JL-18). In addition, both T. oshimai JL-2 and T. thermophilus JL-18 harbor genes for archaeal-type V0-V1 (vacuolar) type ATPases, which appears to have been acquired from Archaea prior to the divergence of the modern Thermales . T. scotoductus SA-01 has been reported to be capable of dissimilatory Fe3+ reduction; however, the biochemical basis of iron reduction has not been elucidated in Thermus [41,59]. Sequences of proteins involved in iron reduction  in Shewanella oneidensis MR-1 (MtrA, MtrF, OmcA) and Geobacter sulfurreducens KN400 (OmcB, OmcE, OmcS, OmcT, OmcZ) were used as search queries into Thermus genomes using BLASTP. No hits were found in T. oshimai JL-2, T. thermophilus JL-18, or T. scotoductus SA-01. This suggests that the biochemical basis of iron reduction is distinct in Thermus compared to Shewanella and Geobacter, and offers no predictive information on whether T. oshimai JL-2 and T. thermophilus JL-18 may be able to respire iron. 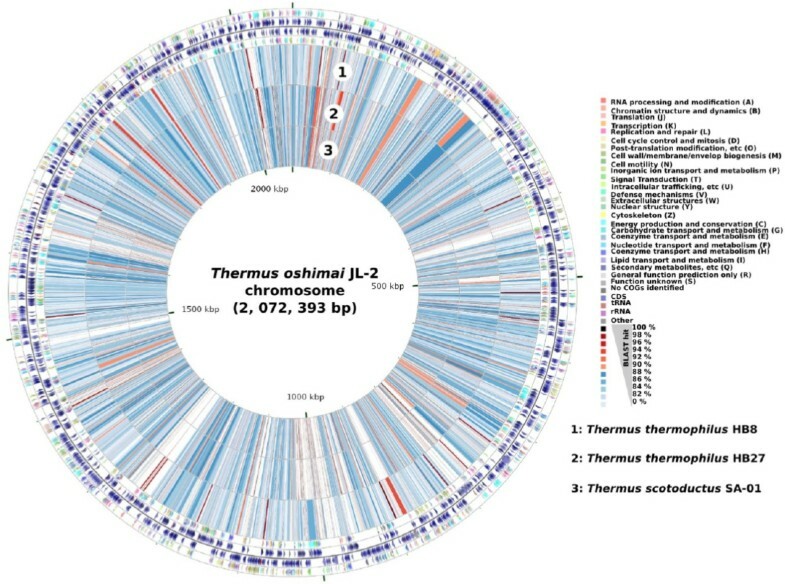 A complete sox cluster comprising of 15 genes, including soxCD, is present in T. oshimai JL-2 and T. thermophilus JL-18 genomes. SoxCD is essential for chemotrophic growth of P. pantotrophus . Taken together, this suggests that T. oshimai JL-2 and T. thermophilus JL-18 may use thiosulfate as an electron donor and are similar to other sulfur-oxidizing Thermus strains including T. scotoductus IT-7254  and T. scotoductus SA-01 . Other T. thermophilus genomes also harbor this gene cluster, suggesting thiosulfate oxidation may be widely distributed in Thermus . A variety of chemotrophs and anoxygenic phototrophs can oxidize hydrogen sulfide, organic sulfur compounds, sulfite, and thiosulfate as electron donors for respiration . Reconstituted proteins of SoxXA, SoxYZ, SoxB and SoxCD together, but not alone, mediate the oxidation of thiosulfate, sulfite, sulfur, and hydrogen sulfide in Paratrophus pantotrophus . The absence of free intermediates of sulfur oxidation and the occurrence of sulfite oxidation without SoxCD in P. pantotrophus excludes SoxCD as a sulfite dehydrogenase and provides evidence to its role as a sulfur dehydrogenase with protein-bound sulfur atom . In T. oshimai JL-2, three proteins showed high sequence identity to PsrA (88%; Theos_0751), PsrB (86%; Theos_0750), and PsrC (83%; Theos_0749) of T. thermophilus HB27, which is likely involved in anaerobic respiration using polysulfide as a terminal electron acceptor. In T. thermophilus HB27, PsrA is the putative catalytic subunit containing two molybdopterin guanine dinucleotide co-factors and a cubane-type [4Fe-4S] cluster. Electron transfer is likely mediated by PsrB, which also contains a [4Fe-4S] cluster, while PsrC is a putative transmembrane protein that contains the electron carrier menaquinone-7 (MK-7). PSR functions as a hexamer (composed of 2 subunits each of A, B and C) and catalyzes the reactions: MKH2→MK + 2H+ + 2e- in the membrane, and Sn2-+ 2e- + 2H+ + Sn-12- + H2S in the periplasm . However, the Thermus PsrABC proteins exhibit very low identity to Wolinella succinogenes PsrABC proteins that have been functionally characterized (PsrA: 33%, PsrB 46%, no clear BLASTP hits found in T. oshimai JL-2 for W. succinogenes PsrC) . In Wolinella succinogenes, formate dehydrogenase or hydrogenase and polysulfide reductase form the electron transport chain and mediate the reduction of polysulfide with formate or H2 . In T. oshimai JL-2, Theos_1377 encodes a putative formate dehydrogenase alpha subunit. Another gene, Theos_1111, encodes a putative formate dehydrogenase family accessory protein (FdhD), which is required for regulation of the formate dehydrogenase catalytic subunit  and is conserved in many members of the Thermaceae, including T. scotoductus SA-01 (TSC_c10040). Although the genes needed for polysulfide reduction are present, polysulfide reduction in T. oshimai JL-2 has not been tested. A significant number of genes in hyperthermophilic bacteria are of archaeal origin, and appear to have been acquired through inter-domain gene transfer , which is mediated by both transformation and conjugation systems . T. thermophilus HB27 is naturally competent to both linear and circular DNA, and DNA transport mechanisms in this species have been well studied [69,70]. The genome of T. oshimai JL-2 and T. thermophilus JL-18 both contain homologs of DNA transport genes (Table 5), suggesting that both T. oshimai JL-2 and T. thermophilus JL-18 are naturally competent. †BLASTP analysis using sequences of known competence proteins from T. thermophilus HB27 as queries. Table modified from . We report the finished genomes of T. oshimai JL-2 and T. thermophilus JL-18. T. oshimai JL-2 is the first complete genome to be reported for this species, while T. thermophilus JL-18 is the fourth genome to be reported for T. thermophilus. Analysis of the genomes revealed that they encode enzymes for the reduction of nitrate to nitrous oxide, which is consistent with the high flux of nitrous oxide reported in GBS , and explains the truncated denitrification phenotype reported for many Thermus isolates obtained from that system . It is intriguing that Thermus scotoductus SA-01 also has genes encoding the sequential reduction of nitrate to nitrous oxide but lacks genes encoding the nitrous oxide reductase. The high degree of synteny in the respiratory gene cluster combined with the conserved absence of the nitrous oxide reductase suggests incomplete denitrification might be a previously unrecognized but conserved feature of denitrification pathways in the genus Thermus, although T. thermophilus NAR1 appears to be capable of complete denitrification to N2 . Another unusual feature of the T. oshimai JL-2 and T. scotoductus SA-01 denitrification systems is the apparent presence of the NO-forming, Cu-containing nitrite reductase, NirK, and the isofunctional tetraheme cytochrome cd1-containing nitrite reductase, NirS. T. oshimai JL-2 and T. thermophilus JL-18 also may be capable of sulfur oxidation since they both encode a complete, chromosomal sox cluster. However, experiments with GBS sediments failed to demonstrate a stimulation of denitrification when thiosulfate was added in excess , suggesting thiosulfate oxidation may not be coupled to denitrification in these organisms. The presence of psrA, psrB and psrC genes encoding polysulfide reducatase in T. oshimai JL-2 suggests the ability to reduce polysulfide. The function of these putative pathways could be tested with pure cultures in the laboratory. The presence of complete macromolecular machinery for natural competence and the presence of megaplasmids harboring genes for nitrate/nitrite reduction and thermophily points out that T. oshimai JL-2 and T. thermophilus JL-18 could have acquired innumerable genes through intra- and inter-domain gene transfer, and suggests considerable plasticity in denitrification pathways. Considering the importance of these organisms in the nitrogen biogeochemical cycle, and their potential as sources of enzymes for biotechnology applications, the complete genome sequences of T. oshimai JL-2 and T. thermophilus JL-18 are valuable resources for both basic and applied research. The work conducted by the US Department of Energy Joint Genome Institute is supported by the Office of Science of the US Department of Energy under Contract No. DE-AC02-05CH11231. Additional support was supported by NSF Grant Numbers MCB-0546865 and EPS-9977809. We are also grateful for support from Greg Fullmer through the UNLV Foundation.